Board of Directors of Lions Club of Balaju for L.Y. 2016-17 . Since 1984, Lions Club of Balaju has been performing several social works, such as Health Camps, Environment Awareness program, Community Development Program, Literacy Project, Sight Services, Hearing Service, Youth Development Program, Drug Awareness Program and Education Projects etc. Lions Club of Balaju was inaugurated on June 19, 1984 by the then ruling district governor late Lion T. B. Dahal in a cozy room of Balaju Yantra Shala Sanitary engineering Ltd. at Balaju Industrial District, Balaju, Kathmandu after completing the required orientation to the proposed members. The organization of this club was a solo effort of Lion Thakur Hira Singh, Past District Governor of District 325 who was also the Extention Chairman of this club. 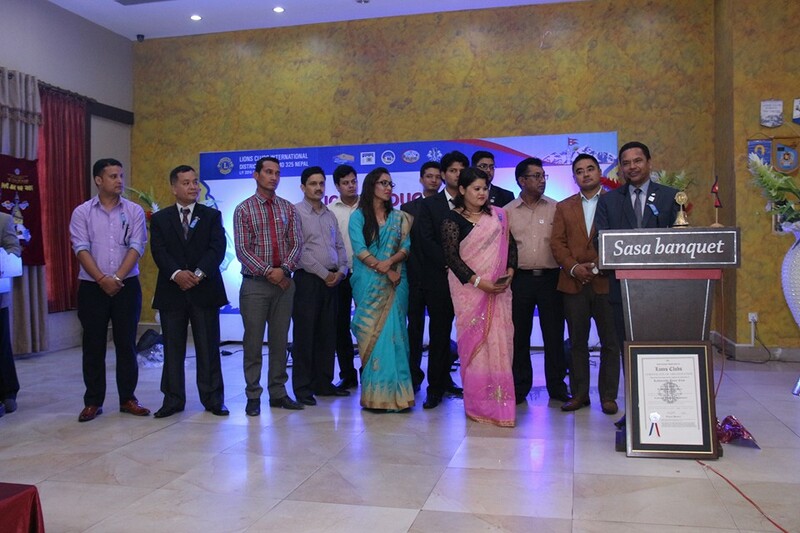 This club was sponsored by Lions Club of Kathmandu, a pioneer club in our multiple district. The International Association of Lions Clubs had approved the charter of this club and affi xed the signature of International President and Secretary on June 28, 1984. Past Dstrict Governor late Lion Dr. N. P.Singh had presented the offi cial charter to the club on September 21, 1985 amidst a very colorful function at Hotel Everest Sheraton, Kathmandu. The club was established with 20 charter members representing mostly from the industrial houses. The club was led by Lion Gautam Man Shrestha as Charter President and Lion Rajesh Prasad and Lion Shree Ram Bhakta Mathema as Charter Secretary and Treasurer. Service Activities Lions Club of Balaju is constantly on its wheel in many fields of social service activities. The adoption of “Child Day Care Centre” at Balaju Industrial District established by Business and Professional Women’s club was ground breaking works. Other prestigious projects taken by this club were ENT, Eye, Dental Camps and Diabetics checkup camps. Mid ear operation ENT camps in joint collaboration with BRUNOS of England and Impact Nepal at Pokhara, Dharan, Dolakha and Kathmandu are praise worthy. Regular monthly blood donation at Blood Transfusion Centre in the initial stage helped the centre to motivate other donors. Donations for flood victims, Drug Awareness campaign, health camps are also its regular program. The concept of joint activities with other institutions and clubs were also developed, which was unique in its nature. The club with the help and financial assistance of Lions Club of Nagoya Nakamura of Japan jointly donated a very sophisticated and expensive OLYMPUS Surgical Operating Microscope for Neuro Surgery to Bir Hospital. This has strengthened the neuro surgical activities at Bir Hospital which was not possible in the past. With the assistance of World Bank funded project the club had completed fi ve drinking water projects and benefi ted more than thousand families of the villages. School at Man Mainju VDC was also supported by the club in building construction and other facilities. The club has continued organizing different Health camps and Cataract Surgery camps in very remote area of Nepal like Bhhacchek and other remote areas of Dhading District. ‎After the devastating Earthquake we are became more active and continuously serving to earthquake victims in different way, we started our mission from Search and rescue, Relief and now we are in Re-building phase. We have successfully completed, inaugurated and handover centennial legacy project Shree Basanta primary school. Furke, Basant , Makwanpur in partnership between Lions Club of Balaju, Kathmandu Bishal Bazar, Kathmandu Durbarmarg, Kathmandu Peace Eyes and Balaju youth leo, of District 325B1 Nepal and funded by Lions Club of Bayan Baru, Malaysiais joint project of District 325B1 Nepal and District 308B1, Malaysia. Beside that the Club has different service projects, which are continuously organizing by the clubs. Stride : promotes diabetes awareness and the importance of healthy exercise for people with diabetes or those at risk for the disease. Foods and Fruits distribution Program at Old aged Homes. Art competition & Peace poster Contest. Drug and HIV-AIDS awareness program. Volunteers service in different social and culture activities. School Level Essay, Art, Quiz, Spelling & Oratory contest. The club has twining with different international Lions Clubs and organizing jointly programs and projects. The organization of Leo Club of Balaju 26 years before was a very successful project. Leos are very active in the participation of the activities of the club and also developing their skill excellently. Many Leo of the club has joined their Lions Clubs to strengthen their mother club. Present District Cabinet Secretary of District 325B1, Nepal and past president of the Club Lion Mani Shree R. Bajracharya was a dedicated Leo and had also served the Leo District as District President. Members of Lions Clubs of Balaju is proud to have such Leos and we consider them as an asset of the club. The club has also extended many lions clubs viz. Lions Club of Kathmandu Bagmati, Lions Club of Kathmandu Arniko, Lions Club of Kathmandu Manasalu, Lions Club of Haratimata, Lions Club of Kathmandu Peace Eyes and first and only one Leo Lions Club of Nepal Lions Club of Balaju Youth Leo during this period and all of them are very active. The club is also organizing fellowship programs like Football Tournament, Picnic program , overnight stay programs to motivate the members. Our Charter President, Motivator Lion Gautam Man Shrestha lead District 325 in Lionist Year 1993-94, in his tenure he established Nepal Lions Foundation ( NLF ) which is pilot Project of Nepalese Lionism. Another Dynamic past District Governor Late Lion R.M.Pradhana also became a District Governor of District 325, Nepal in Lionist Year 1994-95. The present president of Lions Club of Balaju, Lion Sushila Pakhrin Tamang became the First Lady President of the club. In her leadership the Club has motivated with full energy.